There is a dark place for every light one on this earth. Even Moy Mell with its beautiful, warm sands and sparkling waters can sometimes surprise the magi that lives there. 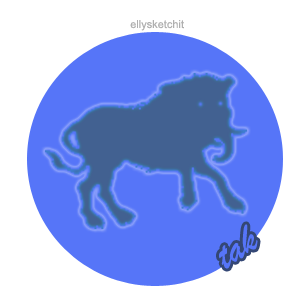 Elly heard a strangely-compelling chant one night under the trumpeting of prancing baku that flickered in and out of her subconscious. When she awoke the baku had coalesced and were sitting at her side, eyes glowing in the dim light of her bedroom. They've stayed with her ever since and have proven very loyal, yet she's never been able to forget or decipher the muttering chant she heard when they first found her. Mi him, can de lach, mi him, min en tow. Tak!